Contact lenses come in so many options, it can be hard to choose. Your eye doctors in North Wales and Philadelphia, PA can help you make the decision that best meets your needs. Here is what Dr. Brewer has to say about daily disposable contacts. There are many advantages to wearing daily disposable contact lenses. They are cleaner, safer and healthier. If you have eye allergies or dry eyes contact lenses can be tricky, but daily contacts may be the best choice. Using a fresh pair of lenses every time you wear contacts reduces the build-up of protein, allergens and irritating deposits on your lenses. Have you had enough of all those calendar reminders telling you when it's time to replace your contact lenses? Daily lenses have the easiest wearing schedule, of course. Wear a new pair every day… which also minimizes lens care. You won’t have to clean your contacts, rub them with solution, and store them in a special contact lens case. Daily disposable contacts are really convenient. Single use contacts are also ideal for part-time contact lens wearers. If you usually wear glasses, but want to have the option of wearing contact lenses once in a while, like when you go swimming or play sports, consider keeping a supply of disposable contacts on hand for occasional use. At Dr. Gretchen J. Brewer O.D. 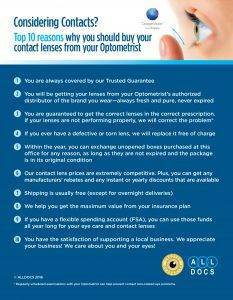 & Associates our optometrists are contact lens specialists, and we are motivated to help even the hard-to-fit contact lens patients. If you thought you were not a good candidate for contact, but would like to try them, please book an appointment at one of our locations so we can give you the opportunity to benefit from contact lenses. You can buy contact lenses online or directly from the Dr. Gretchen J. Brewer O.D. & Associates office.